We always like to showcase the noteworthy, the remarkable, the powerful, the inspirational and the just down-right outstanding individuals that made us all fall in love with swimming, biking and running even more than we already did, and the next category is…. Mixed Relay Masters. 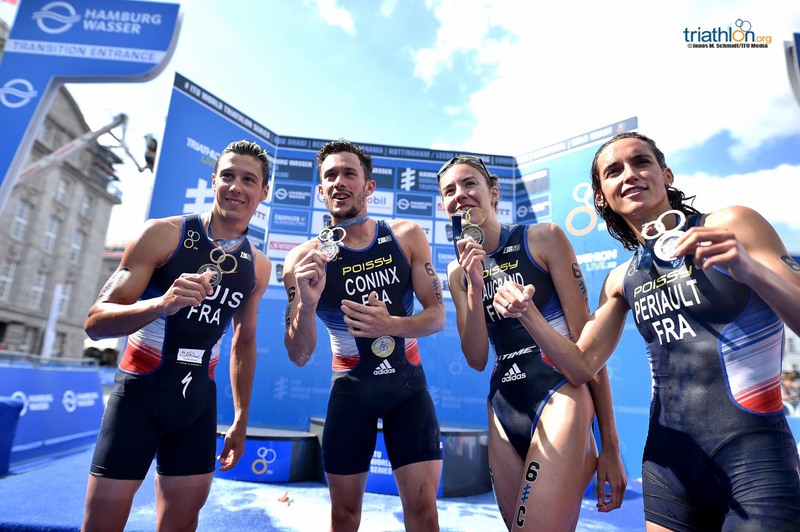 In 2018, the ITU Mixed Relay Series debuted alongside the regular WTS season after the decision was made that the sport would officially be included in the Tokyo 2020 Olympic programme. With an additional medal event in the Olympics, elites were eager to start earning qualification points. The first stop in the Series was in Nottingham, England, then the Mixed Relay World Championships were held in Hamburg before one final stop in Edmonton, Canada. In all three events, Team France was a standout national team. Starting out in Nottingham, France early on established themselves as one of the strongest teams and caused a lead change in the race a couple times due to the strong running and cycling abilities of teammates such as Cassandre Beaugrand and Pierre Le Corre. They took the bronze medal in the first race of the Series. It was in Hamburg at the World Championships, however, that France proved their dominance. The lead was first won at the end of the first women’s leg when Leonie Periault passed off to Dorian Coninx. He then sped off and grounded in an over-20 second lead over the field going into the third leg with Beaugrand. While she was almost caught on the bike portion, her strong running abilities kept France alive and well and she passed off to the final man, Vincent Luis. Luis then was left wide open to take charge and hold onto the lead and never let go and France ran it home to snag the title by a leading margin of 43 seconds. 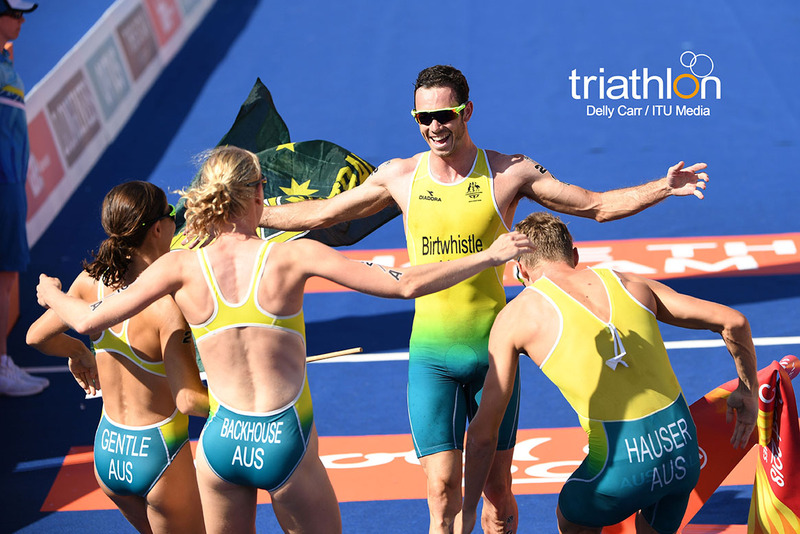 While Team Australia did not hold onto their World Championship title from 2017 this year, they did collect two noteworthy Mixed Relay wins. In the 2018 Gold Coast Commonwealth Games, Australia represented the home nation and delivered on home soil. A close battle between Australia and the English Team carried out throughout the first two legs of the race and looked like the gold could go to either team. However, on the third leg it was Ashleigh Gentle who managed to get a lead over the field so that when she tagged off to the final man, Jacob Birtwhistle, they had a 23-second margin over the English. They then were clear to finish the race unscathed and were named the Commonwealth Games Champions. The strength that was shown in the Gold Coast was also evident in all three Mixed Relay Series events. In Nottingham, Australia just missed the podium and finish fourth. Then in Hamburg at the Mixed Relay World Championships, they fought to reclaim their 2017 World Crown. While ultimately it was Team France who stole that Title from them, they still produced a fantastic and daring come-from-behind performance to pass Team USA on the blue carpet to get the silver medal. Then finally in Edmonton, Team Australia’s success came full circle when they returned to the top of the podium when they won the final event of the Mixed Relay season.